I’m doing a series on Stand-out Authors — Authors whose books are 2013 Sonderbooks Stand-outs, but are not making their first appearances on my lists. Laini Taylor is another who has a Sonderbooks Stand-out for the fourth time this year. I first read her books in 2009. The first one I read was Dreamdark: Blackbringer, which I thought was excellent, and gave a starred review. Then I read its sequel, Silksinger, and was completely blown away. 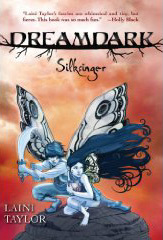 Silksinger was #6 in Fantasy Teen Fiction on the 2009 Sonderbooks Stand-outs. The same year, I read Lips Touch: Three Times, an innovative collection of three highly original stories. That book was #8 in Fantasy Teen Fiction the same year. Laini Taylor began a new series in 2011, which is consistently excellent. The first book, Daughter of Smoke and Bone, was #2 in Teen Fiction, Fantasy on my 2011 Sonderbooks Stand-outs, with an amazing story about a devil in love with an angel. And I read the second book in the series this past year, and wasn’t a bit surprised when it was also a Stand-out. Days of Blood and Starlight was #7 in Teen Fiction on my 2013 Sonderbooks Stand-outs, continuing the dramatic story. What I noticed about Laini Taylor’s books right from the start is she has the resonance of folklore themes — but not your traditional western folklore. There are twists to these fairies, angels, and demons. She has a whole new perspective, and her imagination stands out. I have no doubt whatsoever that her books will continue to appear on my Stand-outs lists for many years to come. This entry was posted on Monday, March 3rd, 2014 at 10:31 pm and is filed under Stand-outs. You can follow any responses to this entry through the RSS 2.0 feed. You can leave a response, or trackback from your own site.